Beginning with such baby milestones as drinking milk, crying to communicate, and making others smile, and continuing into the toddler years with advice on talking, brushing teeth, and getting rid of diapers, the big sister blends sensibility (“You’ll spend hours learning how much cups can hold.”) with humor (“And how much they can’t.”). While children will laugh at the spills and mess associated with babies, their caregivers will appreciate the parents in the book, who are often sleepless or busy chasing the exploring toddler. Author Sarah Tsiang and illustrator Qin Leng previously teamed up in A Flock of Shoes, an imaginative tale about where shoes go in the off-season. Once again, Leng’s expressive watercolor illustrations, rendered in a cartoon-style, add to the merriment of the amusing text. 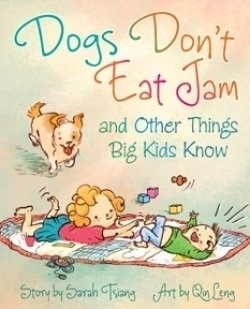 Readers who enjoyed the adorable puppy in the duo’s first book will be thrilled to watch the antics of another puppy that adds to the comic relief. As the older sister explains how her little brother will mature, she also demonstrates her own self-assurance and her parents’ unconditional love. The best lesson she teaches him is that despite accidents, tantrums, and occasional disobedience, “mad goes away but love stays.” Parents who want their children to focus on the special bond between siblings rather than the inconveniences of less lap time and shared toys will want to read this heartening story to both big and little siblings—together.